High quality vinyl replacement windows, such as the windows installed by Guida Door & Window, are virtually maintenance free. However, as with any product exposed to atmospheric conditions, they will become dirty and require cleaning from time to time. With very little effort your vinyl windows will retain their “just new” look for many years to come. In most cases, exterior dirt and grime will wash away during the next heavy rain storm. BE CAREFUL! Use all common safety methods to minimize the risk of hazard. DO NOT lean out the windows to clean exterior glass surface. DO NOT depend on screen for support or retention. Screens will not prevent someone from falling out the window. CAUTION! Most severe window accidents occur on the first floor. IF IN DOUBT of precautions and dangers, hire a licensed, and insured professional window cleaning service. Always wash the frames and sashes with a soft cloth or ordinary long-handled soft bristle brush. For removal of most common dirt and grime, use a solution of mild dish washing detergent and warm water. Avoid washing windows with high pressure sprays, guns, and hoses. Clean both sides of your glass with any popular glass cleaner and soft cloth or paper towel. Be sure the window locking mechanism is in the unlock position. Raise the window sash approximately 3 inches. Grasp each side of the sash and use your index finger to disengage tilt latches. Slowly lower the sash to a convenient cleaning level. Clean the exterior surface (using a popular glass cleaner and soft cloth or paper towel) by supporting the sash with one hand and cleaning with the other. Return the sash to original position and be sure both tilt latches click into place. Tilt-in lower sash by as described in previous instructions. Support the lower sash by using a chair, step ladder, or some other stable support. Be sure to pad the support to prevent damage and be sure sash is supported by the sash frame. Do not support sash by resting the glass on the support. Pull upper sash down approximately three inches. Grasp each side of the sash and disengage tilt latches with index fingers. Return the upper sash to the original position and be sure both tilt latches click into place. Return the lower sash to original position and be sure both tilt latches click into place. Unlock the locking mechanism on the sash. Slide sash to its fully opened position. Grasp sash on either side and lift it into the head of the window until bottom of sash clears the sill. Tilt bottom of sash out and remove the sash from the frame. Place sash on a soft padded surface and clean exterior glass surface. Replace sash into frame by repeating steps 1-4 in reverse order. 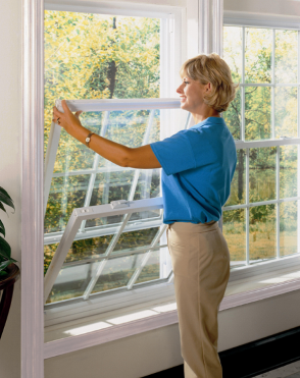 Note: Optional Tilt-In Slider windows are cleaned in similarly to that of a double hung window (pictured). Turn the locking mechanism to its unlocked position. Crank sash open to 90 degrees. Wash exterior glass surface by using a common glass cleaner and a soft cloth or paper towel. Crank window to its closed position. Resources: The preceding How to Clean Vinyl Windows instructions have been provided by Soft-Lite Window manufacturer.